Save time. Reduce costs. Achieve outstanding results. 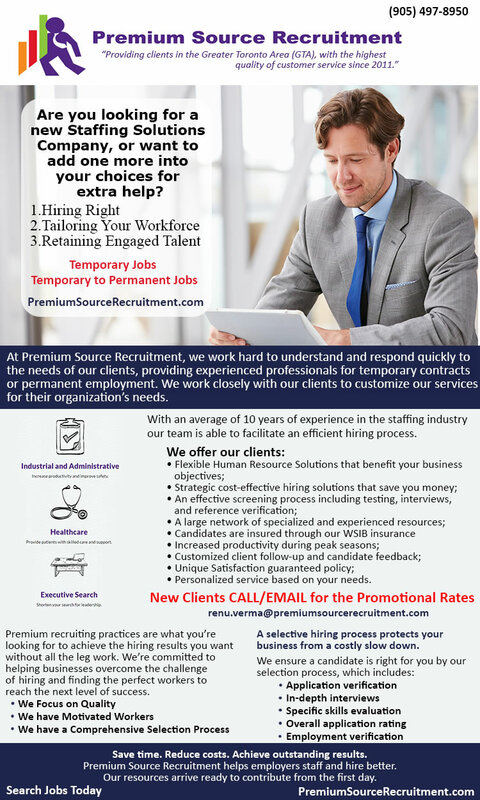 Premium Source Recruitment helps employers staff and hire better. Our resources arrive ready to contribute from the first day. At Premium Source Recruitment, we put each candidate through an extensive screening process. We interview, reference check and test using Kenexa ProveIt! to ensure that they have all required skills. By partnering with us, you gain access to highly qualified candidates without the time and expense of advertising, recruiting and screening. Whether you need flexible staffing to keep up with seasonal demand, experienced professionals to staff your healthcare facility or a proven leader to run your organization, Premium Source Recruitment provides the resources you need. Temporary. Business needs change frequently. You need quick access to the resources required to keep up. Premium can help you meet production demands, avoid skills shortages and take on new challenges. Temp-to-Hire. Try one of our employees at your facility to assess their skills and fit before making an offer. Reduce the risk of making a hire you regret. Executive Search. Shorten the search for your next inspiring leader. With our proven process and extensive network, you’ll choose from only the best potential executives. We do the legwork while you focus on achieving your goals.